Added Tomica Discontinued Models Catalog, which I find very useful. 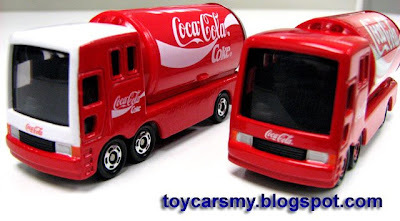 As you know Tomica will release 2 new models each month to replace the existing 120 running number. Each replaced model will be removed from Tomica production, or referred as discontinued model. Some of these models are still available in the market, but soon it will become rare in the later time. I suggest you to have some of these models if you find them adorable, either for collection or investment. Get them while you can, it will be too late for you to regret later. I don't know where you got this information, but still see most of these models in Vietnam now. So, do you know the replacement? What is the different between the red "tomy" and blue "tomy"? Oh, I got it. Let me check!